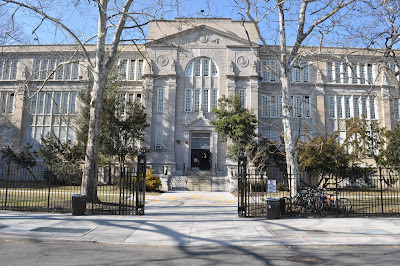 Notes from Grover Cleveland HS receivership hearing; can the Chancellor's "Framework for Great Schools" be achieved with class sizes as large as 55? There were about fifty people in the audience at the Grover Cleveland High School receivership hearings yesterday -- not great for a school that enrolls nearly 2,000 students, but not terrible considering it was a beautiful Saturday morning and the hearing announcement was made just a few days before. Principal Denise Vittor followed with a power point presentation showing how the school was improving its graduation rate and attendance – the two data points that apparently had placed it on the state list of “struggling schools” for possible Receivership. The four-year June graduation rate last year rose to 60.7% compared to 53% in 2012-13; the August four-year rate is 62.5% compared to 60.2% two years before. If only those students eligible for a regular diploma were counted, its four year rate was up to 63.9%. Apparently 2.2% of the students are severely disabled, and according to the principal, only “eligible” for the alternate credentials of the SACC (Skills and Achievement Commencement Credential) or the CDOS (Career Development and Occupational Studies Commencement Credential.) The six year graduation rate increased to 69.5%, and attendance at 82.5% last year, compared to 78% in 2012-13. She then went on to describe various programs the schools had instituted, including “Common Core aligned curriculum units,” AP courses, a Saturday academy, Afterschool Expanded Learning Time, blended learning and CTE programs. The one new program for this year is “schoolwide implementation of PBIS (Positive Behavioral Intervention and Supports) , which are alternative ways of dealing with school discipline. · What resources has the school received under the Renewal program? Answer: Extended learning time and more professional development. · Is there a plan to reduce class size, especially considering that last year there were classes as large as 54 in math, 37 in English and 38 in Social Studies? Answer: Most of our classes last year met the legal limit ( meaning the UFT contractual limit of 34 students per class). · What funding is there for electronic resources? Answer: We receive $22,000 from NYSTL (New York State Textbook Law) funds, and Reso A funds from the City Council for smartboards. · Can CTE programs for the health professions be added? Answer: Unfortunately not; nursing CTE programs require class sizes of nine, and we don’t have the funds. · Why is the school receiving only 82% of its Fair Student Funding (FSF)? Answer: FSF was developed as an “ideal” funding level; while all Renewal schools are receiving 100% FSF, it is uncertain if the school will receive a higher share of its FSF until a team at DOE looks into the “comprehensive needs” of the school. At that time new resources may be allocated. · How can a school boost its enrollment when letters were sent out saying the school may be closing? Answer: The Chancellor is committed to not closing schools, though we’re obligated to send letters about struggling and persistently struggling schools (to whom?). The principal added that community members and parents should help “re-brand” the school, and let people know that we’re on a fast track to coming off the struggling list. · How can I participate as a parent towards helping the school? Answer: Come to our monthly PA meetings; we also have workshops you can attend. Members of the audience were invited to speak. Several teachers noted that as the school lost enrollment, it had also lost funding leading to increased class sizes. Parents suggested that the school could provide more information to them about class assignments, etc. by sending messages to their cell phones; these messages should also be translated into their native languages. Students proposed that more clubs and activities like cheerleading and fencing would help create more spirit in the school. A Queens UFT representative thanked the Chancellor and the Mayor for taking a “different approach” than the previous administration, and addressing students’ “social and emotional needs.” David Aglialoro, Communications Director from Cathy Nolan’s office, read a statement from the Assemblymember. As a 1976 graduate, AM Nolan stands behind the school, recognizes that is getting back on track, and believes that with the right support and resources it can be “the best version of itself.” Among other things, she recommended that the school be transformed into a Community school, and that its swimming pool be opened on the weekends to neighborhood residents. Evelyn Cruz, Chief of Staff of Congresswoman Velázquez observed that it was "unconstitutional" that the school still is burdened with such large class sizes, especially given how many students are linguistically diverse and are struggling to learn a new language. The school requires more resources to hire additional teachers; with smaller classes, she pointed out, the students would be less likely to walk out of class because they don’t comprehend the material. The school also needs dedicated funding for more guidance counselors. I followed by saying that I was glad to hear of some of the promising ways the school was improving its results, but none of these measures have the rigorous research behind them that class size reduction does. The fact that “most” of the classes met the legal limit of 34 last year is not good enough, especially as in 2007, NYC promised the state as part of the Contracts for Excellence law to reduce class size to an average of 25 in high schools citywide. In all struggling high schools like Grover Cleveland, class sizes should immediately be capped at 25 or less. “Rigorous instruction” is nearly impossible to attain when there are thirty or more students in a class, many of them English Language Learners, unable to get enough feedback or practice speaking to be “actively engaged in in ambitious intellectual activity” or “develop critical thinking skills,” as the Framework demands. How can there be a truly “Supportive Environment” for students with classes this large, with too little individualized attention to feel “safe, supported, and challenged by their teachers and peers”? As for “Collaborative Teachers,” do teachers really have “a culture of respect and continuous improvement” when burdened with excessive class sizes and a teaching load of a 150 or more students? Can “Effective School Leadership” be maintained, affording“the instructional and social-emotional support that drives student achievement” when students are crammed into classes of thirty or more? It would also be far easier to create “Strong Family and Community Ties” if each teacher had fewer students, with the time to reach out to parents when their children are succeeding as well as when they are falling behind. Finally, it is difficult to see how real “Trust” can be attained, when the administration is ignoring what is the top priority of parents citywide for school improvement – class size reduction. After the hearing was over, I spoke to several teachers at the school. They all confirmed that this fall, class sizes remain at about the contractual maximum of 34 students per class or more; and that even English Language Learners are not provided with smaller classes. This is clearly unacceptable. While the graduation and attendance rates at the school may continue to inch upwards, the quality of education at this school and others like it will not fundamentally improve without a concerted effort to provide more targeted resources so that class sizes can be capped at 25 or less. also can be submitted here, no later than 5:00 p.m. on the second business day after each school's hearing date. Translated versions of the School Receivership Public Feedback form can be found here for submission as well. Tonight, Class Size Matters will be speaking at the Flushing HS receivership hearings, and tomorrow morning at the Grover Cleveland HS hearings. Here are the schools at risk of being put in receivership by the state, along with the hearing dates. It is a travesty that 66% of the struggling schools on the State receivership list and 57% of the schools on the City's renewal list continue to suffer from class sizes of 30 or more last year. I wrote about this totally unacceptable state of affairs for Gotham Gazette last month. Flushing HS is also hugely overcrowded, and instead of capping enrollment at the school and using available space to reduce class size, DOE placed two new schools in their building several years ago, which is projected to worsen overcrowding and has caused the school to lose about ten additional classrooms this year. Here are our comments on Grover Cleveland HS; according to DOE data, there were classes as large as 54 students per class last year at the school. Our comments on Flushing HS are below. We are urging DOE that as a first step, all academic classes should be capped at 25 or less in every struggling school.